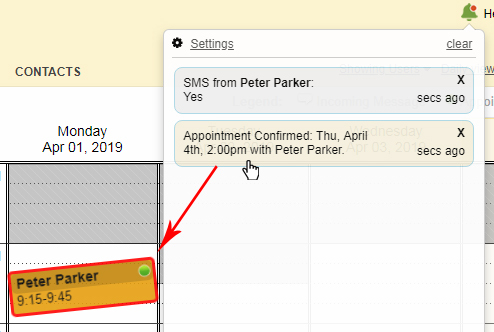 Clicking (or hovering over) notifications will ‘wiggle’ the relevant appointment within the calendar letting you immediately see which appointment has been updated. The “Settings” option will bring you to Notification alerts where you can now select which events you would like to receive a notification for (for example each time a client books a new appointment, or each time a client replies to a text reminder). Please let us know if you’ve any feedback on this new option!